This is my second entry for this year’s an event apart 10k contest. It’s published right here. Go there, try it and put some comments! All taxi drivers went on strike. You are the only one who can satisfy the needs of this city! 3D inside canvas HTML5 2D context. I had to develop some tricky functions to perform textured polygon rendering in basic canvas. WebGL was not allowed because the game had to work in browsers that don’t suppor that feature. 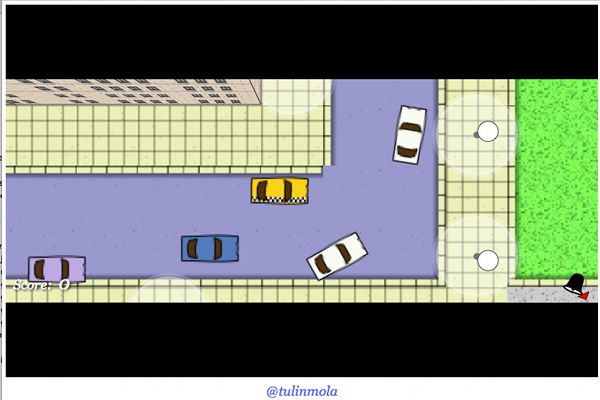 Full physics for cars and city elements (such buildings, lamps, …). Cars move all around the city, trying not to crash with each other. But when they collide (or your taxi crashes with them) they do exceptionally well! A big fully textured generated city. Due to the 10k contest limit I couldn’t afford using external graphics or city definition. With a couple of simple textures I’d reach the size limit! So I had to generate all the city an its graphics in load time. The generated city is cool! 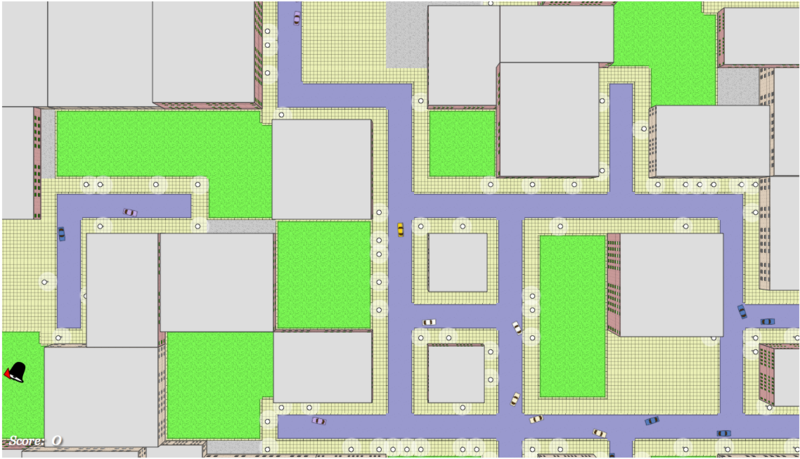 I’ve used some graph theory algorithms for creating roads, greedy algorithms to generate buildings and deterministic random numbers to obtain always the desired city. All graphics are vectorial. Some of them where drawn using inkscape and then converted to HTML5 canvas functions and optimized manually. And I think I’ve got a nice comic style! Path finding. When you attend a call you are telling to go some place in a given time. 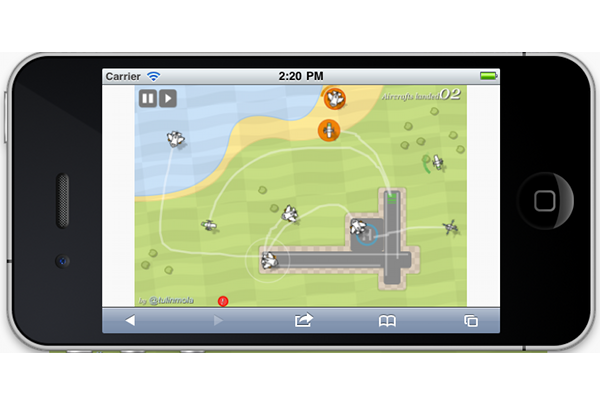 Then, some arrows appear on the roads to help you reaching your goal, like using a GPS. That arrows mark the shortest path to your goal driving using the roads. But of course you can take shortcuts between buildings or through parks, taking less time and getting more points. And so much more. Lots of details to make all things work. I will post some of the techniques used in this game when I have time. So come back soon and maybe yo will find new freaky entries! My this year 10k an event apart contest entry have just been published! You can try it by clicking here! “All air traffic controllers are on strike and you are the only one who can make all those aircrafts land”. This is the premise behind this addictive game. 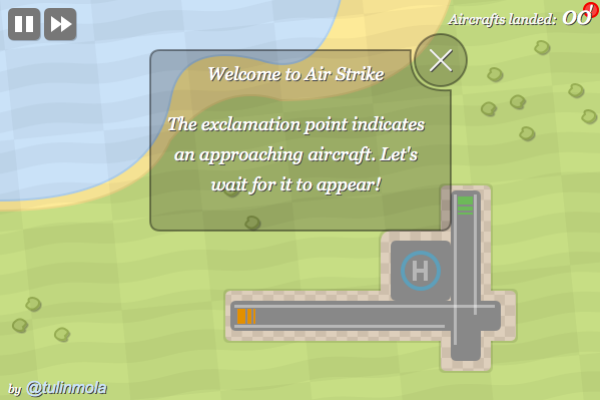 You have to make aircrafts going to their respective airstrips for landing, being careful not to crash them. Playing is easy. 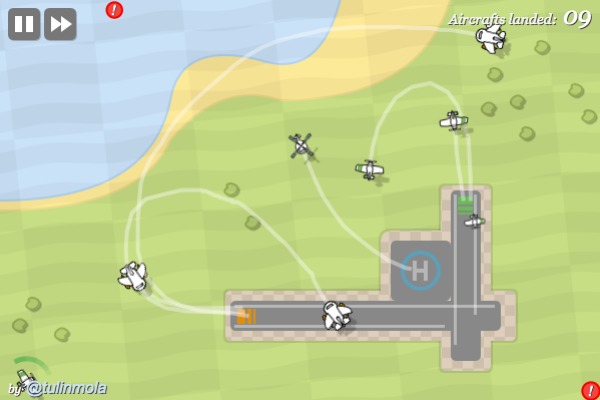 Use your mouse or finger to make aircrafts follow a path to their respective airstrips. Avoid them crashing and land as much as you can. Have fun with the game and leave some comments on the entry for the contest! I’ve seen Android web browser reduces the quality of images inside an HTML in load time. I’ve reproduced this behaviour with some Android 2.x devices and various emulator configurations. It seems that when it loads 24 or 32 bits images it reduces them to 16bits (4 bits per component: reed, green, blue and alpha). And you cannot do anything about it (if you know how to avoid it, please tell me!). Why would you do this? The answer is PNG compression. But when we try to use this technique in Android browsers, due to that image bit reduction, we only get useless broken data. Look at canvas getImageData method documentation if necessary to understand all the code above. This is like we were lossing the 4 less significant bits. The logic behind it is that Android browser converts all images to 16 bits, 4 bits per component. So, even our image was 8 bits gray scale, it only respects the 4 more significant bits, repeating them for the red, green and blue components. So if we want to use the PNG data extraction method and doing it in a fully portable way (or at least working on Android) this method is not valid, because our data will be broken! In the second part of this article we will discuss one relatively easy solution to this problem. Stay tunned. It was hard to fit it in only 10K. I took the character graphics from Amstrad emulator screenshots, cleaned with Gimp and compressed using the awesome PunyPNG tool. It gave me all graphics in only 1KB. I’d like to add much more enemies and levels. But that was not possible due to size limitations and contest deadline. So I only could make the first game level. In a near future I’ll optimize all the code to work in mobile devices too and publish it here, allowing people to create new levels and share them. You can try it in my contest entry, clicking in Lauch button. 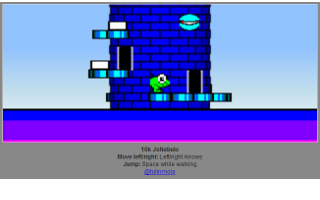 You have to make the frog reach the top of the tower being careful with enemies and traps. 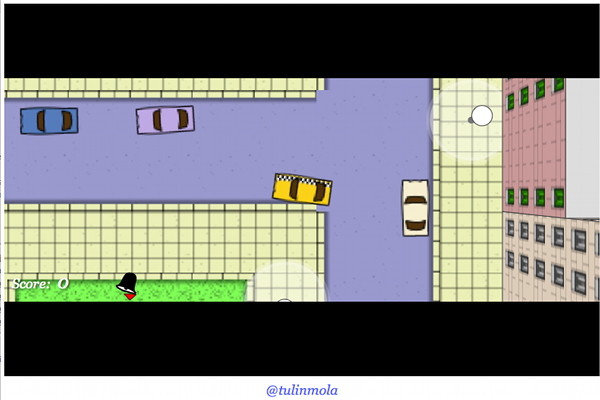 Use arrow keys to move, activate elevators and doors, and space key while walking to jump. Good luck!